Rated PG. Perental Guidance. General viewing, but some scenes may be unsuitable for young children. Brand New. Factory Sealed. This is an Eros Internationl brand of the Hindi DVD. Has the UPC Code 828970149693. Has EROS Seal. 16x9 Anmorphic Widescreen. 158 minutes Color. Dolby Digital 5.1/Stereo Sound. NTSC - ALL REGIONS. MASTERED FROM HIGH DEFINITION (HD). BOTH THE MOVIE AND SONGS HAVE ENGLISH SUBTITLES. Produced & Directed by: SUBHASH GHAI. Music: A. R. RAHMAN. Lyrics: GULZAR. Starring: Anil Kapoor, Salman Khan, Katrina Kaif, Zayed Khan & Others. Release Date: Nov 21, 2008 (USA). Three brothers are constantly fighting and playing games with each other to inherit their father’s wealth. However, when Anushka comes in to explain them the power of relationships over the power of money, they all have a change of heart. 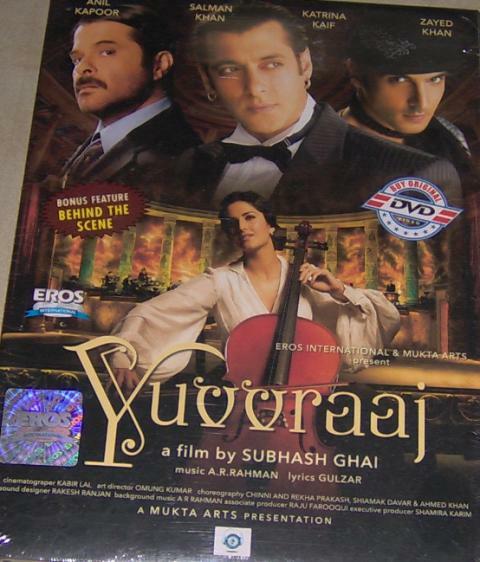 Buy Yuvvraaj (DVD, 2008), sold & shipped by Movie Time Video where you can shop online for Pooja Mandir, Bajot, Gifts, Hindi Movie DVD / CD, Music Video. This Salman Khan Film collection has been tagged as LN7 1 RR 2.50 9.49 anil kapoor salman khan katrina kaif zayed khan.